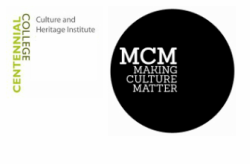 Students of Centennial College's Culture and Heritage Site Management program are currently developing a symposium for March 6th 2015 at Hart House, in Toronto Ontario. This interdisciplinary post-graduate program encourages students to pursue opportunities to further their education in the public and private heritage and culture sector. Our March symposium seeks to expand these initiatives beyond the classroom by encouraging students and current professionals to learn together. By exploring the themes of accessibility, pop culture, and marketing at this year's symposium we aim to nurture sector wide discussion and learning on the future of our industry.